When the Lord spoke to Bob about writing a book on the wedding in Revelation, he went on a 40–day fast to seek His will and direction on the assignment. While on the fast, the Lord instructed him to make a drawing of the symbolic throne scene based on Rev. 4 and 5 along with other passages such as Ez. 1, 10 and Daniel 7 (vision of throne and wheels). And the hair of His head was like pure wool. 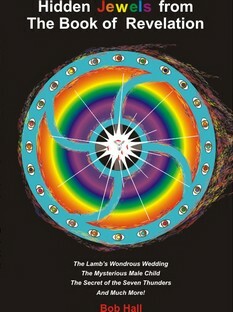 The book reveals in depth many things about the wedding of the Lamb to his bride as well as the birth of the male child. He used to be in leadership in a Messianic Jewish congregation, and he draws from ancient Jewish wedding and feast customs to reveal many mysteries from the book of Revelation that are hidden from a Gentile church. There is no other book on Revelation like this one -- almost everything in it will be new to the reader. Hidden Jewels from The Book of Revelation presents a new light and a new paradigm for understanding the book of Revelation. Available exclusively from Lulu pub. Click here to Order your copy today.